Property Size 792 sq. ft.
Fleming-O (pronounced “Flamingo”) is located on one-way Fleming Street in the middle of historic Old Town Key West and only two blocks from world famous Duval Street and its restaurants, bars, art galleries, and shops. This completely upgraded Conch Cottage has all the modern amenities you would expect. The contemporary kitchen with a cathedral ceiling is equipped with a full-size refrigerator, stove/oven, all cookware, utensils, dishes, and convenient countertop appliances. The eat-in kitchen has a dining table and seating for four in addition to two stools at the breakfast bar. Glass sliding doors open to a fenced, private deck that includes a gas grill, two chaise lounges, built-in benches, an outdoor dining table, and outdoor shower. Both bedrooms share the common area bath, with double-basin pedestal sink and beautifully-tiled walk-in shower. One bedroom has a queen bed and the other has two twin beds that can be converted to a king bed upon request. The living room contains a queen convertible sofa. All linens and towels, including beach towels, are supplied. The home is equipped with a new stacked washer and dryer located in a bathroom closet. The owners have thoughtfully installed a central air system, which is a luxury that few Old Town rental properties possess. Both bedrooms and the living room contain flat-screen TVs. The large front porch is a few steps above the street, making it the perfect place to sit on the wicker chairs and relax with your morning coffee. The location is ideal—just blocks from Blue Heaven and Pepe’s, the best breakfast spots in town; Mangia Mangia Pasta Café; Michaels Restaurant; Sarabeth’s Kitchen; Seven Fish; A & B Lobster; Conch Republic; The Boat House Bar and Grill; Alonzo’s; BO’s, a Key West classic; and many more. The nightlife venues located within a short walking distance include Margaritaville; Willie T’s; The Green Parrot; Schooner Wharf; Rick’s/Durty Harry’s; The Hog’s Breath Saloon; Sloppy Joe’s; Irish Kevin’s; and Captain Tony’s. Parking in Key West is very limited. This property has no assigned parking and is street parking only. You are responsible for finding parking for your vehicle. Parking: No dedicated parking space; on-street parking only. Sleeping Arrangements: 1 queen bed, 2 twin beds, and queen sleeper sofa. Pets: Pets are welcome with fee; some restrictions may apply. We spent 5 days in this cute little cottage. Great location, close to Duval St & the Harbour. Would definitely stay here again. Excellent! This was my second visit and it was absolutely excellent. Excellent location excellent betting excellent front and back porch! I can't wait to go again. Amazing!!!! Nice and Clean Perfect for a small group and great down town location to Duval. Very clean and updated house but still has that old Key West feel. Very well located to the marina as well as Duval. Ac is also nice and cold during the summer! We wI'll be booking this house again it was great! Fleming - O house I absolutely loved staying at Fleming house! As soon as you walk in you feel great energy, very comfortable. Makes you feel at home & very clean. Cool decor & is bigger than it looks. I stayed alone & feels safe. I was able to park my car & not get in it the rest of the trip. The house is walking distance to Duval. Also has a great front porch to just people watch & you feel tucked away at the same time. This is definitely 5 star house ! I will be coming back for sure! Thank you Fleming house for making my visit the best! PERFECT LOCATION AND FULL OF ISLAND CHARM! After living in Key West for 22 years, I moved away over a year ago. This was my first time being a tourist and I stayed at Fleminig-O. What a great decision!!! You can't get a better location, close to Duval, restaurants, Fausto's (grocery store), attractions and the Seaport! The house is spotless and smartly decorated with Keys character that will make you want to just stay in all the time! Loved the front porch for people watching and the back porch for the shady privacy. The master bed was so very comfortable. Not you usual vacation bedding!! It was equipped with everything you could ask for and it made me want to move back to Key West again. I will definitely stay at Fleming-O again and I highly recommend it!! You absolutely love this cottage before you walk through the front door. It's clean, comfortable, and so cute. We made it our home away from home for a week and would recommend this beauty to everyone. I've been to Key West three times, plan on many more visits, and by far the best stay was at Fleming-O! Walking distance to everywhere. People watching from the front porch-everyone walking by stopped to chat. And the best nights sleep, every night. So peaceful and quaint! Will definitely stay again!! Wonderful Cottage in Key West Our stay at Fleming O was wonderful. We enjoyed the location and did not move our car the entire weekend. The house is decorated beautifully and was so comfortable to kick off our shoes and just relax. We highly recommend the cottage to others. Cute & Cozy KW cottage From the very beginning, the rental booking company was easy and VERY helpful with all the reservations and questions I had. And since it had been a long time planning this trip, several friends who had to coordinate flying into town and working out a kid free girls only weekend, everything needed to be on point and this house and office delivered. This vacay was for a 40th birthday girl friends get a way weekend and this house added so much to the whole experience, would NOT have been the same had we stayed elsewhere! From the quiet safe neighborhood just a short walk off Duval, we parked the car for 4 days and didn't move it til we packed up to leave! Then we were welcomed by the warm inviting front porch and the cute quirky pink flamingo decor. Next upon entering, the homey front room we plopped down many a time in the rest our feet, laugh, chat and catch up on life. The CLEAN bedrooms, large bathroom and of course the hallway, everyone LOVED the natural wood wall decor in there. The large kitchen was fully stocked with whatever we needed and it gave us many good times together cooking various meals and whipping up fun cocktails. We did not want to eat out every meal and this was a big plus so we could all spend more quality time together. And the back outside porch & grill area, perfect relaxing space. From beginning to unfortunately we had to end, our trip and rental of Fleming-o was excellent. Already recommending this house to friends and family. Us ladies will definitely return and I will also use this rental again for future family vacations. A Little Key West Hideaway My stay at Fleming O was fabulous. My sister and cousin were in from out of town (I live in Fort Lauderdale, FL) and we decided to head to Key West for a few days. Fleming O is the cutest house in old Key West, just a few blocks from Duval Street. The accommodations were wonderful. The house is decorated in Key West charm. Keep looking around and you will find something of interest to all....Key West all the way! The beds were extremely comfortable. The kitchen is fully stocked with everything you would need to make great meals if needed. The patio is charming with a gas grill to cook some of that fresh fish you may have caught during the day! 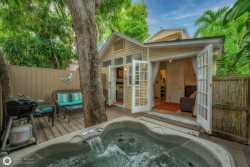 You can sit on the front porch and relax with an adult beverage and watch the people walk by and just relax after a long day of Key West adventures. All in all we had a great stay, just wish we would have been able to stay longer. I would highly recommend the Fleming O house to anyone venturing to Key West, for a few days or longer! Great stay at Fleming-O. Wonderful cottage at a perfect location. Easy to get to great restaurants and bars. Fun to sit on the front porch and watch people go by while enjoying a drink and a book. Neighbors were friendly and helpful, would enjoy living at this location. House was very clean and had everything that I needed. Full kitchen with private deck off it for outdoor dining, but who wants to cook when so many places to eat are close by. Highly recommend the Fleming-O to anyone that wants to get a good feel for Key West, not just a stay at a commercial hotel with all the other tourists. Parking in Key West is very limited. This property has no assigned parking and is street parking only. You are responsible for finding parking for your vehicle. The maximum people allowed in this property is 6. If there are more than 6 people are in your party upon arrival, your party will be asked to leave without compensation. Violation of ANY house rules will result in your party being asked to leave without compensation.